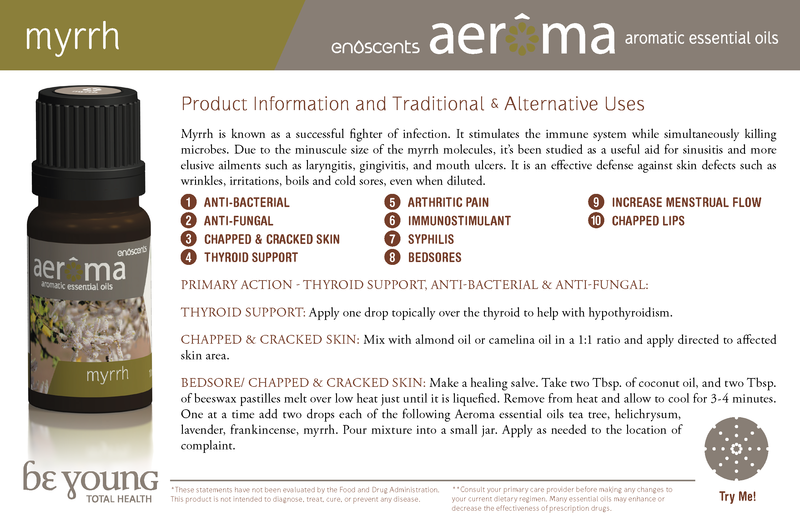 Myrrh is a red-brown sap-like substance that is extracted from Commiphora myrrha tree. Myrrh essential oil is distilled from the aromatic resin of trees in the genus Commiphora (in the same family as Bosweilla from which Frankincense is derived). Much like Frankincense, the resin Myrrh has been in use for thousands of years and is very well-known for its healing powers. Topically, Myrrh oil may be used as a soothing balm to relieve muscle and joint pain. Containing powerful and potent antioxidants, Myrrh is ideal for clarifying and rejuvenating skin. When used in an essential oil diffuser, Myrrh oil promotes emotional well-being and provides relief from digestive issues. Antioxidant: Results clearly show that essential oil of Commiphora myrrha provides the best protection against squalene peroxidation. These results demonstrate that squalene peroxidation during solar exposure is mainly because of singlet oxygen and not due to free radical attack. This suggests that sun care cosmetics should make use not only of free radical scavengers but also of singlet oxygen quenchers. (3).